An autopsy-based, cross-sectional study conducted in correlation with the relevant clinical records and the reports from investigating agencies. A purposive sampling technique was applied to select the study sample of 100 post-mortems autopsies between November 2008 and May 2010 of road traffic accident subjected to medico-legal autopsy at the department of Forensic Medicine, KIMS Hospital Bangalore, India - a tertiary care center. RTA was defined as an accident, which took place on the road between two or more objects, one of which must be any kind of a moving vehicle. The data were compiled with a focus on the analysis of injuries in the thoraco-abdominal region with special reference to the nature of the wound and organs most commonly affected in road traffic accidents and epidemiological factors in relation to victims, vehicles, and sites of impacts, etc. Besides, features pertaining to hosts (road users), the agents (vehicles) and the environmental condition (road, seasons, time etc. ), and their period of survival will be studied. The majority of the victims were aged 21 to 40 years 50 (50.0%); most of the victims were male 92 (92.0%); and male/female ratio was 11.5:1. More crashes 37 (37.0%) took place between 6:00 PM to 12:00 PM. Majority of the RTA took place on weekends 55 (55.0%) at city roads 70 (70.0%). Details of RTA victims and their epidemiology have been provided in [Table 1]. Two-wheeler occupants were the most common victims of road traffic accidents 52 (52.0%), followed by pedestrians/bicycle 38 (38.0%), and light motor vehicle (LMV) 8 (8.0%). Most common injuries in RTA were external thoracic injuries observed in 73 (73%) of victims, followed by abdominal injuries observed in 49 (49%), head injuries in 47 (47%) of cases, extremities in 46 (Upper limb 33 and Lower limb 13) (46%) of victims, vertebra in 7 (7%), pelvis in 5 (5%), and spinal card in 4 (4%) of the victims. External abdominal injuries were involved in 44 cases. Most common type of injury was contusion 21 (47.7%), followed by abrasion 16 (36.3%), laceration 5 (11.3%), and incised wounds 2 (4.5%). Internal abdominal injuries were observed in 49 cases. In road traffic accidents, the most commonly injured abdominal solid organs were liver 16 (32.6%) followed by spleen 9 (18.3%). Details of abdomino-pelvic injuries have been given in [Table 2]. Among the abdominal injuries sustained in road traffic accidents, the liver and spleen injured more lacerations than contusions, whereas in the kidney, contusion was the common. External injuries to the thorax were more frequent than internal injuries while in the abdomen, internal injuries were more frequently observed than external injuries. External thoracic injuries were observed in 73 cases; commonest was contusion 39 (53.4%) followed by abrasions 28 (38.3%), lacerations 7 (9.5%), and incised wounds 1 (1.3%). Bony cage sustained injuries were observed in 71; out of this, fractures of ribs were observed in 45 (63.3%) victims, clavicle in 14 (19.7%), sternum was 6 (8.4%), and vertebrae 6 (8.4%) of fatal road traffic accidents. Internal thoracic injuries were observed in 26 cases. Among internal thoracic injuries, lungs were the most commonly involved organ 24 (92.3%), followed by the heart 2 (7.6%). Lung sustained more lacerations 19 (79.1%) than contusions 5 (20.8%). The most common cause of death in RTA was head injury 47 (47.0%); second common cause of death was persistent irreversible shock in 42 deaths (42.0%), and considerable amount of cause of death was septicemia 11 (11.0%). Survival time in detail has shown in [Table 3]. Commonest offending agents were heavy motor vehicles 54 (54.0%). In 24 (24%) cases, the offending vehicles would be LMV and in remained 12 (12.0%) were with two-wheeler, and 10 (10%) unknown indicating the incidence of 'hit and run' cases. Fracture extremities details have been provided in [Table 4]. This study has found that majority of the Road Traffic Accidents (RTA) victims were aged 21 to 40 years (50.0%). Other similar studies conducted by Chaudhary et al. and Suresh Kumar  founds the similar findings (51.2%) and (83%), respectively. Most of the victims were males (92.0%). Agnihotri et al. and Khajuria et al. studies observed the same result, (80.58%) and (85.14%), respectively. Present study found 37.0% of the RTA occurred in between 6:00 PM to 12:00 PM, and 55.0% took place on weekends. Kimberly et al. also argued the same,  but Khajuria et al. reported that 54.22% RTAs occurred during the daytime, between 9 AM to 8 PM. Nearly 3 quarter of the RTA occurred at city cross roads (70.0%). Research has shown that the two-wheeler occupants are among the majority to be affected in RTA. 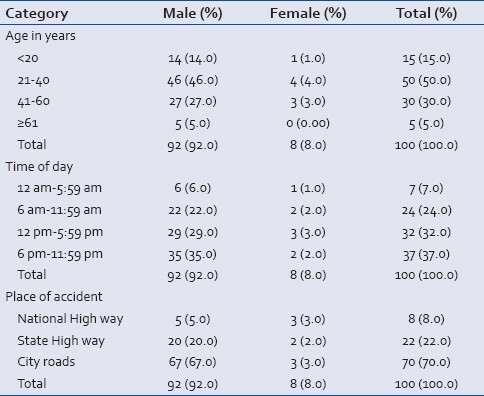 In our study, most of the victims who sustained thoraco-abdominal injuries in the road traffic crashes (52% (riders 38% and Pillion riders 14%)) were two-wheeler occupants, followed by pedestrians (38%) and LMVs (8%). Our findings in this regard correlate well with the earlier studies. Chaudhary et al. and Suresh Kumar et al. study also found that most of the victims were (34.5%) two-wheeler riders and 23% were of pedestrians, and the common region of injury was the chest. But, Archana et al. study contradicted with our findings; they observed that pedestrians were maximum number of fatalities (35.79%), followed by motorized two-wheelers (motor cyclist scooterist etc.) (30.5%), and lowest incidence have been noted among pedal cyclists (5.47%). Motor cyclist/scooterists comprise of most commonly involved group in fatal RTA reason being careless speed driving, thrill seeking, overtaking, and less stability of the vehicle. Besides, these vehicles are mostly used by 15-50 years age group. In current study, most common abdominal solid organs injured were liver (32.6%), spleen (18.3%), and kidney (12.24%). But, Suresh Kumar et al. and Bakkannavar et al. argued that most common solid abdominal organ involved was kidney, (48%) and (23%), respectively, followed by the liver (39.7%). Ravindra et al. and Maurice et al. contradicted the above both statements; they found that the most commonly injured organ was spleen in both the studies (52.9%) and (50%), respectively. In this study, liver and spleen injured more lacerations than contusions, whereas in the kidney, contusion was the common. Suresh Kumar et al. also supported our findings. The abdomen is vulnerable to injury since there is minimal bony protection for underlying organs. Lungs were the most commonly involved organs (92.3%) in the thoracic region followed by the heart (7.6%). Suresh Kumar et al. and Bakkannavar et al. studies also confirmed our study findings that lungs were the most common organ injured, 61.3% and 61% in thoracic region, respectively. The lungs occupy most of the rib cage, and thus are probably more vulnerable to injury when compared to the heart. Lungs sustained more lacerations (79.1%) than contusions (20.8%). The period of survival after meet with accident: In this study, 20% of the victims died on the spot and 39% were survived up to 24 hours, and majority of the victims survived more than 24 hours (41%), but these too died within 21 days. Archana et al. study also supported our findings,  whereas in Meera et al. study, the results was quite contradictory; the 47% of them were died on the spot, and 44% were died within 24 hours. Most common cause of death in RTA was head injury 47 (47.0%), second common cause of death was irreversible shock in 42 (42.0%), and in remained, septicemia 11 (11.0%) was the cause of deaths. Khajuria et al. study also confirmed our findings. But, this observations has been opposed by Ravindra et al. study and Meera et al. study; shock was the major culprit (62.7%) and (44%), respectively. Offending agent cause for the accident: Heavy vehicles (trucks, oil tanker, lorries, bus etc.) have been found to be mostly responsible for 54.0% of cases, followed by light vehicles (car, jeep, van, taxies) 24.0%, and 12% by two-wheeler of fatal RTA. Similar studies from India also observed same findings. , The involvement of the heavy vehicles is due to rash driving, poor condition of the roads and vehicle, and lack of discipline among the drivers. Majority of the times in road traffic accidents, young and productive males were injured or lost their life. More than 50% of the accidents were found to occur during the weekends. Since road users are not uniform population, these are exposed to different kinds of hazards depending upon conditions prevailing in that region, hence present different epidemiological findings. This study may help the planners to take safety measures, to implement strict traffic rules, to risk stratification in the susceptible population to educate the people, and the study of nature of offending agent in RTA can help the authorities to plan better availability of health care on roads. 1. Paden M, McGee K, Krug E. Injury: A leading cause of the global burden of disease. Geneva, Switzerland: World Health Organization; 2000. 2002. 2. World Health Organization. Regional Office for South-East Asia, New Delhi. Strategic plan for injury prevention and control in South-East Asia. New Delhi. 2002. www.searo.who.int/LinkFiles/whd04_Documents_Accident-8.pdf [Last cited on 2012 Sep 19]. 3. Park K. Accidents and Injuries. In: Park K, editor. Park's Textbook of Preventive and Social Medicine. 21 st ed. Jabalpur, India: M/S Banarasidas Bhanot Publishers; 2011. p. 374-79. 4. Yawe King David T, Onoja F, Inunduh P. Blunt injuries to the abdomen in Makurdi, Benue State: Nigeria. Nigerian J Surg Res 2005;7:173-5. 5. Anjum Fazili MS, Shabana Nazir MB. Clinical Profile and Operative Management Of Blunt Abdominal Trauma (Bat): A Retrospective One-Year Experience At Smhs Hospital, Kashmir, India. JK Practitioner 2001;8:219-21. 7. Chaudhary BL, Singh D, Tirpude BH, Sharma RK, Meel V. Profile of Road Traffic Accident Cases in Kasturba Hospital of M.G.I.M.S., Sevagram, Wardha, Maharashtra. Indian Med 2005;5. Available from: http://www.indmedica.com/journals.php?journalid=9andissueid=70andarticleid= 884andaction=article [Last cited on 2012 Jul 22]. 8. Suresh Kumar SB, Tanuj K, Ritesh GM, Shankar MB, Vinod CN, Yoganarasimha K. Victim Profile and Pattern of Thoraco-Abdominal Injuries ustained in Fatal Road Traffic Accidents. J Indian Acad Forensic Med 2012;34:17-20. 9. Agnihotri AK, Joshi HS, Tsmilshina N. Study of Craniofacial Trauma in a Tertiary Care Hospital, Western Nepal. Medico-Legal Update. Indian Med 2005;5. Available from: http://www.indmedica.com/journals.php?journalid=9andissueid=67andarticleid=858andaction=article [Last cited on 2012 Jul 22]. 10. Khajuria B, Sharma R, Verma A. A Profile of the Autopsies of Road Traffic Accident Victims in Jammu. J Clin Diagnost Res 2008;2:639-42. 11. Kimberly M, Auman MS, Joseph AK, Michael FM, Ballesteros MS, John E, et al. Autopsy Study of Motorcyclist Fatalities: The Effect of the 1992 Maryland Motorcycle Helmet Use Law. Am J Public Health 2002;92:1352-5. 12. Norton R, Matlin SA. The role of health research in the prevention and control of road traffic injuries in South Asia. J Coll Physicians Surg Pak. 2004;14:705-6. 13. Archana K, Sinha US, Kapoor AK, Pathak YK, Susheel S, Singh A, et al. An Epidemiological study of Fatal Road Traffic Accidents in Allahabad region. Indian Internet J Forensic Med Toxicol 2005;3:. 14. Jha N, Srinivasa DK, Roy G, Jagdish S. Injury pattern among road traffic accident cases: A study from South India. Indian J Community Med 2003;28:84-90. 15. Bakkannavar SM, Nayak VC. Victim Profile and Pattern of Thoraco-Abdominal Injuries Sustained in Fatal Road Traffic Accidents. J Indian Acad Forensic Med 2012;34:17-20. 16. Ravindra SH, Vijay Kumar AG, Ajay Kumar TS, Vinay RH. Fatal blunt abdominal trauma - A three year analysis. Indian J Forensic Med Toxicol 2011;5:135-7. 17. Maurice EA, Anietimfon UE, Okon OB, Gabriel U, Ogbu N, Cyril A, et al. A Prospective Study of Blunt Abdominal Trauma at the University of Calabar Teaching Hospital, Nigeria. Eur J Trauma Emerg Surg 2012;36:164-8. 18. Meera TH, Nabachandra H. A Study of Pattern and Injury Severity Score in Blunt Thoraco-abdominal Trauma cases in Manipal. Ind Med 2005;5(2): Available from http://www.indmedica.com/journals.php?journalid=9andissueid=68andarticleid=865andaction=article [Last accessed on 2005].